The more than $90 million in construction planned for Phase Two will be completed through a staged approach. Sen. Chuck Schumer and the Niagara Falls Bridge Commission (NFBC) officially announced the commencement of construction activity on Phase Two of the Lewiston-Queenston Bridge's U.S. Customs Plaza modernization as part of a major three phase project to enhance operational efficiency and functionality at one of the busiest ports of entry along the U.S.-Canada border. "Whether it's a daily commute, a shopping trip, or a Sabres game, more than three million vehicles cross this bridge every year," said Schumer. "This plaza modernization will make crossing the border easier and more efficient for hundreds of thousands of people who want to come here and contribute to the Western New York economy. I've been proud to work on this project from the very beginning, pushing GSA and CBP to approve this project. 290 folks will work on this stage of the project." "For many years, the Commission has worked diligently to advance the enhancement efforts at this port of entry, which is truly a vital trade and tourism corridor between Western New York and Southern Ontario," said Kenneth Bieger, NFBC general manager. "We appreciate the Senator's ongoing support of safer and more efficient border crossings, and of this crucial project." "I would like to commend all involved for the hard work and determination it took to advance this project," said John Lopinski, NFBC chairman. "The modernization of this crossing is an important initiative that will further facilitate both trade and tourism and we are extremely pleased to see this project come to fruition." The Lewiston-Queenston Land Port of Entry (LPOE) located in Lewiston, N.Y., is the fourth busiest commercial land crossing between the United States and Canada. This announcement marks a significant milestone in Phase Two of the ongoing expansion and renovation of the Lewiston-Queenston LPOE, with Phase One completed in 2016 at a cost of $21 million. The more than $90 million in construction planned for Phase Two will be completed through a staged approach, in order to ensure that the current number of primary inspection lanes (PILS) (10) remain open throughout the duration of the project and therefore help mitigate delays during the various stages. dedicated bus passenger processing area contained within the new facility. "We are excited to move forward with the expansion project," said Rose Brophy, U.S. CBP Buffalo field office director. "The current administrative building is more than 50 years old. This new facility will provide our officers with the modern amenities necessary to complete their important security mission, while also expanding processing capabilities, which will improve efficiency at the border crossing. We look forward to working with our stakeholders as this project gets under way." The commencement of construction on the U.S. Customs Plaza follows the U.S. General Services Administration (GSA) finalizing of a lease agreement in May 2018 for the Department of Homeland Security's Customs and Border Protection (CBP) to cover operational facilities and border inspection services space at the Lewiston-Queenston Bridge crossing. In accordance with GSA's mission to acquire space on behalf of other government agencies, GSA signed a lease with the NFBC for more than 92,000 rentable sq. ft. of space for a term of 20 years, at a rate of approximately $3.45M per year. "GSA is pleased to move this project forward to provide the federal inspection agencies with the facility that helps them fulfill their important missions," said John A. Sarcone III, U.S. GSA Northeast and Caribbean regional administrator. "In addition to the project creating jobs and benefiting the local economy, this new facility will also enhance the experience of travelers from Canada." 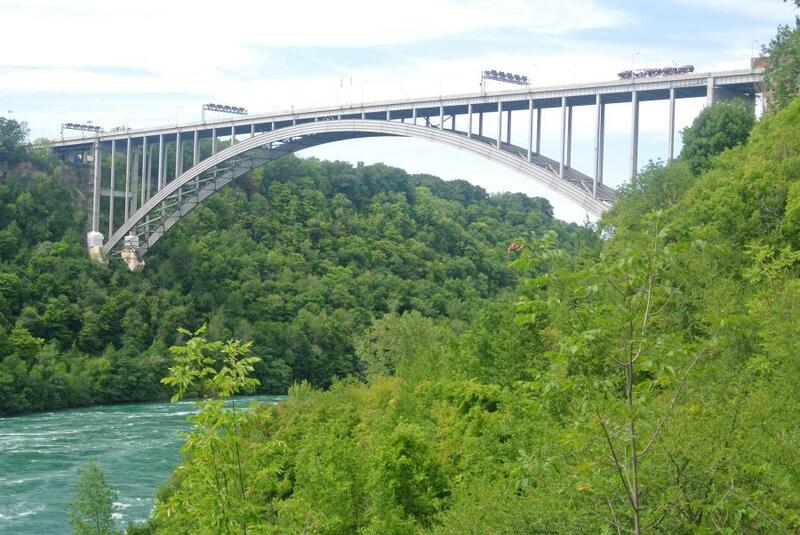 Constructed in 1962, the Lewiston-Queenston Bridge is 370 ft. above the Niagara River and connects United States Interstate 190 with Canadian Highway 405. 1,600 ft. in length, the bridge and its five reversible lanes support more than 2.6 million passenger vehicles and approximately 800,000 commercial trucks annually.